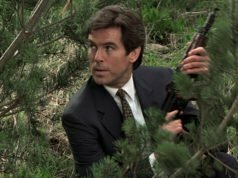 Pierce Brosnan brought James Bond into the 1990s by turning the spy into an action hero in a way no Bond had done before. With less spying and more extraordinary stunts, Brosnan’s Bond started wearing more combat gear to better suit the stunts, as well as suit Bond’s new action hero image. For jumping off the dam and infiltrating the weapons facility at Archangel in the opening of GoldenEye, Pierce Brosnan wears a military jacket, military trousers and an assault vest. Brosnan’s black jacket is a modified American M-1965 field jacket—also called the M65—and made by the venerable Angels and Bermans costumiers. There doesn’t seem to be any reason why James Bond, a British agent, should be dressed in American military gear in Russia, other than because costume designer Lindy Hemming liked the way it looked. Since the jacket is made of cotton and nylon blend, Bond must be wearing a thermal liner or thermal underwear beneath to keep warm in northern Russia. The mid-hip length jacket has a zip front, covered with a fly that secures with press studs. The jacket’s front has two bellows patch pockets on the chest and two set in pockets below the waist, each with a pointed flap that secures with a press stud. There are also patch pockets on the upper sleeves. Hidden inside the jacket around the waist is a drawstring to give the jacket some shape. The shoulders have straps and the collar stands up with a hood hidden inside a zipped compartment. The collar has a nylon strap with velcro on the left side to fasten to the right side of the collar to keep it closed. 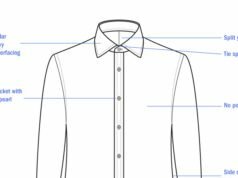 The upper left side of the collar also has a buttonhole, with no apparent button on the other side. The cuffs close with velcro. Over the jacket Brosnan wears a black assault vest that was also made by Angels and Bermans. The vest has a zip front with a nylon strap around the waist that secures with a plastic side-release clasp. The back of the waist strap has a smaller adjustable strap. There are four large pouches along the bottom, two smaller pouches on the right side of the chest with one taller pouch below it. All are kept close with velcro on nylon straps. At waist level on the right is another pouch that secures closed with a flat and press stud. On the left side there is a holster to fit a Walther PPK with a suppressor. The holster is held in place with nylon straps that attach to the vest with plastic side-release clasps, and the PPK is held in the holster with a velcroed nylon strap over the top. There is a pack on the back of the vest to hold a parachute in case the bungee jump went wrong. Bond’s partner Alec Trevelyan (Sean Bean) wears a very similar vest. Brosnan’s black trousers are modified M-1965 field pants, which, like the jacket, are made of a cotton and nylon blend. They have angled, flapped inset pockets on the front for easy access as well as cargo patch pockets on the side of the thighs. The trouser legs tighten around the ankles with either velcro or a drawstring. The black nubuck derby boots have a four pairs of eyelets at the bottom, two pairs of speed hooks above the eyelets and another pair of eyelets at the top. They have moccasin toes and lug soles. The boots are made by Timberland, and back of the sole even say “Timberland” with the tree logo next to it. 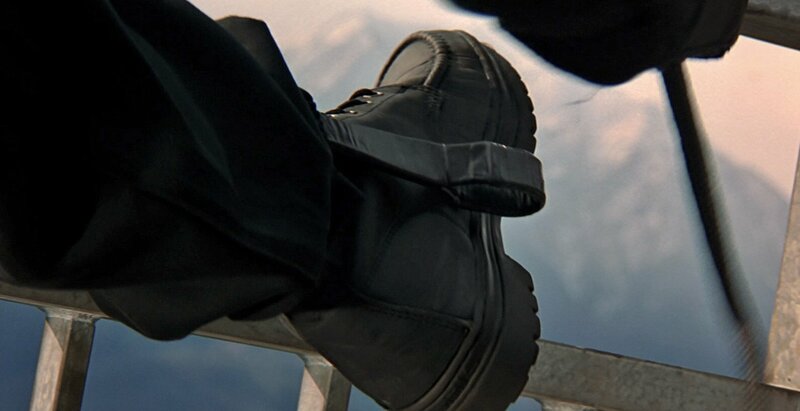 Brosnan wears black leather gloves with black wool cuffs in the outdoor scenes. The gloves were up for auction on 19 September 2017. An example of Pierce Brosnan M65 field jacket was sold at Bonhams in Knightsbridge on 16 November 2005 for £10,800 (http://www.bonhams.com/auctions/11808/lot/395/). Two examples of Sean Bean’s assault vest—which is similar to Brosnan’s vest—were sold at Bonhams in Knightsbridge on 16 Jun 2009. A vest sold along with Bean’s black Sketchers boots for £1,056 (https://www.bonhams.com/auctions/16808/lot/98/), and another vest sold along with Bean’s jumpsuit, which he wears under the vest, for £960 (https://www.bonhams.com/auctions/16808/lot/95/). Thanks to the people at ajb007.co.uk for previously identifying elements in this outfit. Bonds informal/casual clothing are as interesting to analyse as his suits. Also, his informal wear usually reveals more about the era the film was made. Fashions in tailoring usually move much slower. It may be a bit bland, but I think it matches the setting perfectly. All charcoal would be the only improvement that I would made. And it’s really the kind of outfit I have in mind when a secret agent is about to infiltrate a secret base. It seems Lindy Hemming appreciated to put Brosnan in assault vests in Goldeneye, perhaps this was a trick to make him look a bit heavier. Although personnaly I don’t have any problem with Brosnan’s stature in Goldeneye, even if this doesn’t seem to be the case for some people here calling him near-anorexic in 1995… I know that nowadays media have spread the idea that all men should do some bodybuiding, but slim men have their charm too. Besides, Fleming’s Bond wasn’t described as being particulary stocky, I guess. 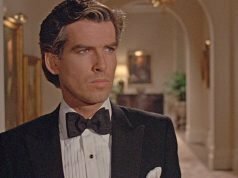 I never paid much attention to Pierce Brosnan’s skinny physique until I was watching Remington Steele with a friend who wouldn’t stop mentioning how skinny he was! The full-cut suits in GoldenEye really helped make him look stronger. Actually Brosnan was by far the closest to book-Bond of all the actors in terms of physical appearance; book-Bond is tall and slender with blue-gray eyes and very straight black hair, with a comma of hair that falls on his forehead. I suppose Dalton and Lazenby (except for eye color) would also come close. As someone who has done that very bungee jump off the same dam (Verzasca Dam, Switzerland)… trust me, there’s no “parachute in case the bungee jump went wrong” option. All of a sudden that cool stunt really sunk in for me as, in actuality, an insanely death defying action, especially knowing that a stuntman actually had to do it. Ah bugger, I meant dam. Brosnan’s Bond, with a few exceptions, is only ever seen in Brioni suits and tactical outfits. I was never a fan of the militarization of Bond’s action clothes during the Brosnan years and am happy they have not returned to it during the Craig era. Looking at those Daily Mail pics, I’m reminded that we’ve had a high speed boat chase down the Thames already…I know that was 16 years ago now but it seems too soon to try and pay homage to TWINE already. Lets hope this is only a small section of a much larger scene and not a stand alone set piece – it would have to be jaw dropping to top Brosnan’s boat chase. FS – I completely agree! And I too think Pierce was, at least in Goldeneye, way too thin to be a credible action hero for 1995. True that the literary Bond was 6’0″ and 167 pounds, but times have changed since he kept himself in shape with 20 pushups and 20 situps every morning (before lighting up the first of 60+ cigarattes each day). Connery and Lazenby were very credible action heroes for any era, but today, they would both be given trainers and high protein diets and supplements. Indeed, they would both likely put Craig to shame given their frames. There is a SAS flavour to these outfits, as the regiment is very prone to “Paint It Black” for assaults. It is highly likely that Bond and Trevelyan have done at least a portion of their training with the SAS. I strongly agree that they would both need thermal undergarments, as I’ve owned several M65 jackets and found that there is virtually no warmth in them, with or without the liner. Of course, they are mass-produced to government contracts. I imagine they have opted for paramilitary kit so they have a slight hope of being treated as soldiers rather than spies if they are caught. I’m told the actual SAS of this era wouldn’t touch the issue “Direct Moulded Sole” boot either – a diabolical piece of kit.